Dive headfirst into a dystopian world devoid of society, law, and order. 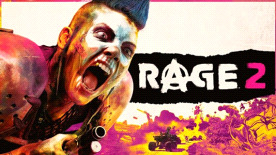 RAGE 2 brings together two studio powerhouses - Avalanche Studios, masters of open world insanity, and id Software, creators of the first-person shooter - to deliver a carnival of carnage where you can go anywhere, shoot anything, and explode everything. Please note - These languagues are text only: Korean, Traditional Chinese & Simplified Chinese.